Notes: The pattern is described by Philip Rowley in his book "Fly Patterns for Stillwaters". The pattern is a popular one within the British Columbia lakes but also has applications within some of our Sierran Lakes as well. The scud back is pulled over the Crystal Chennile and a fine wire rib produces the segmentation. 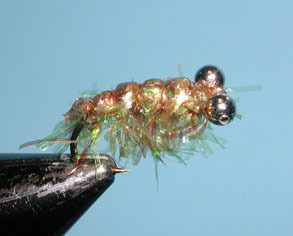 Presentation of the Sparkle Shrimp is near the bottom using an intermediate line. Use a slow hand twist retrieval and stagger the retrievals to simulate erratic motions of the scud.